Right now, the 2011 books are $9.99 and shipping is FREE! At this price, use one coupon and you’ve paid for the book. While Supplies Last! Some cities are already sold out. Sale Ends July 4th. (Akron deal) For $35, you get four bottles of wine (up to a $70 value) at The Grape and Granary. An average bottle of wine at The Grape and Granary costs $12–$13, and today’s Groupon covers up to $17.50 per bottle. • For $10, you get $20 worth of pastas, meats, sandwiches, and other Italian delicacies. • For $45, you get $100 worth of catering services good for warm pasta dishes, signature sub trays, gourmet pizzas, and fresh-baked cakes. Use code BANG or SAVE2011 to get 5% off site wide. Everyday free shipping on over 100 items. Starting July 1 look for Christmas in July deals. Pay $7 for $14 worth of pizza at Master Italian Pizzeria in Strongsville. 20% off on everything – goes through July 4th. • For $25, you get one general-admission ticket in the upper bleachers (a $37.50 value before fees, or up to a $50 value online, including all ticketing fees). • For $31, you get a reserved-seating ticket for sections 4, 5, or 6 (a $49.50 value before fees, or up to a $62.50 value online, including all ticketing fees). Rotisserie chicken – whole – $4.49 – I use the leftover carcass to put my car keys in it. Boneless Chicken Breast – $1.99/lb – here’s the kicker though – it’s enhanced with 15% chicken broth – in other words you are getting 15% less chicken. A cashier told me they are planning to remodel their stores. Look for some items to get clearanced out as they make their changes. Get coupons for Kelloggs products including a .70 Corn Pops coupon (that will double at stores that double .99 an less) and a $1 Smart Source cereal coupon. $5 for $10 in Fresh Donuts & Hot Coffee at Royal Donut! Located at 5759 State Road in Cleveland. Check out these fresh deals. $15 for $30 worth of footwear from Merrell, Sperry, Clarks, Teva and more from PlanetShoes.com. $49 for up to Three Quarter-Acres of Mosquito Barrier Treatment ($129 Value). $20 for A Professional Perm or Relaxer & FREE Roller Set ($57 Value). Located in Mayfield Heights. At Babyfaces Portrait Studio, the Canton studio that specializes in children’s portraits and family shots, receive five sheets of photographs of one pose for $35 — a $70 value. At Westlake Martial Arts grab one knockout month of unlimited karate classes for $62 (a $125 value). The Talent Tree in Hudson is running a deal for an All-Day Activity Camp for $90 (regularly $180). • Monday, July 25, at 7:05 p.m.
• Tuesday, July 26, at 7:05 p.m.
• Wednesday, July 27, at 7:05 p.m.
For $30, you get one two-day commuter pass to Rock the Resort, an open-air festival at Clay’s Park Resort in North Lawrence (a $60 value). The lineup includes eight bands: Third Eye Blind, New Found Glory, Three Days Grace, Saving Abel, Dolson, My Darkest Days, Zander, and Curse Icon. The festival runs Friday, July 8, and Saturday, July 9, and bands begin at 5 p.m. or 6 p.m. each night, with the last band starting at 10 p.m.
For $119, you get a spider vein treatment at Smith Vein Institute in Chardon (a $300 value). • For $10, you get one mezzanine ticket for the game against the Toronto Blue Jays on Thursday, July 7, at 7:05 p.m. (a $20 value). • For $14, you get one lower reserved ticket for the game against the Toronto Blue Jays on Thursday, July 7, at 7:05 p.m. (a $27 value). • For $10, you get one mezzanine ticket for the game against the Los Angeles Angels of Anaheim on Tuesday, July 26, at 7:05 p.m. (a $20 value). • For $14, you get one lower reserved ticket for the game against the Los Angeles Angels of Anaheim on Tuesday, July 26, at 7:05 p.m. (a $27 value). • For $10, you get one mezzanine ticket for the game against the Detroit Tigers on Thursday, August 11, at 7:05 p.m. (a $20 value). • For $14, you get one lower reserved ticket for the game against the Detroit Tigers on Thursday, August 11, at 7:05 p.m. (a $27 value). Get all available Entertainment books for $9.99 plus $1.99 shipping. Get one for a tcity you’ll be travelling to or for local deals. Did you know?… the family that owns Aldis also owns Trader Joes. Womens or Mens MS2 complete golf set – $149.98 – save $250! Surge XL bat – $99.97 – save $200! Look for $10 off $25 purchase coupon in Sunday coupon ad. 10% off your total purchase coupon in ad – good 7/1 & 7/2 – use code online to – Code is NGSE183 – can combine with items that are 70% off and more. Buy online to get free shipping on orders of $49 or more or $5.99 flat rate shipping. Check their Sunday ad insert for a $10 off a $30 purchase coupon – good through 7/4/11. Look for some 50% and 75% off items in the store. Sign up for their rewards program and get a 10% off coupon and other rewards. Want to eat some local produce? Check out these sites that lists local farmers markets, co-ops, farmers, and much more. Sometimes you can find great prices for produce since there are no middle men involved and the farmer is selling directly to the consumer. Unclaimed baggage is sold at a store located in Scottsboro, Alabama. A total of 99.9% of baggage is claimed so the store sells the .1% whose owner can’t be found. Many items are of high quality as many people pack their best outfits and camera equipment, etc. Contact the store at 256-259-1525 or at http://www.unclaimedbaggage.com. If you are shopping online, be sure that the web address reads “https://” instead of “http://” because it will indicate that it’s an encrypted connection. An icon of a small padlock should be visible also. A PCI (Payment Card Industry) logo is beneficial also. For other information on web-site credibility, go to http://www.consumerwebwatch.org. Also check for various online retailer’s privacy policies on the web-site such as TRUSTe – http://www.truste.org, Verisign – http://www.verisign.com, or BBBonline – http://www.bbb.online.org. Another site offers online computer security tips at http://www.onguardonline.gov. With some much online commerce and hacking nowadays it pays to have insurance in case you are hacked. Check with your insurance provider to see what they offer. Paying with credit cards rather than debit cards also provides more coverage. Create a separate account strictly for coupon/money-saving-related activity to minimize any security issues with your personal account. Create a password that will help reduce security issues. Avoid common words or numbers for passwords. Creating a password only in lowercase will take hackers just days if not minutes to guess it, if it is 8 characters or less. Create a password with upper- and lowercase letters, numbers, and symbols. Use a minimum of 7 characters. A study found that by using a 6 character password it would take up to 18 days for a hacker to randomly guess your password. Using 7 characters it will take 4 years as long as lowercase and uppcase letters are used along with numbers and symbols. At 8 characters using the same it would take up to 463 years. Whole Foods has coupons available on their site and in the store. Click here to get a 50 cent off coupon for Driscoll berries. The coupon doubles at Giant Eagle. Print the coupons from Coupons.com before they disappear at the end of the month. Want freebies? Go to http://www.freestuffsites.net. Certain cities have long commute times costing drivers time and money, especially during rush hour. It’s best to live closest to your job, if possible, in these cities. The 2010 Urban Mobility Report found that Chicago and Washington D.C. had the most hours lost to rush hour traffic at 70 hours. It was followed by LA (63 hours), Houston (58), Baltimore (50), San Francisco/Oakland (49), Dallas/Fort Worth (48), Boston (48), Denver (47), Atlanta (44), and Seattle (44). The average was 39 hours for urban U.S. cities. Cleveland was ranked 66th at 19 hours. The congestion cost about $808 on average annually. What makes this study more interesting is the amount of money it costs just to get to work. Someone making minimum wage (the federal minimum wage is $7.25) or close to it has to work at least an hour to cover transportation costs before they even start to earn anything. Figure that if you bought a used, leased, or new car it costs to pay for insurance, maintenance, and to pay it off. A used car costs more to maintenance. A new car costs more up front. A leased car gets no resale value. All in all the cost can be about the same per year depending on how good your used car is. Figure it costs, at minimum, $300 a month to have a car between insurance, an averaged cost of the car and maintenance costs. Most people drive around 15,000 miles a year. That equates to 24 cents a mile. If you drive 20 miles roundtrip (10 miles one way), it costs $4.80 and that doesn’t include the cost of gas. With gas it’s easily now $8 just to get to that destination. Take out taxes from your job and now you have to work around two hours to start earning anything. Many minimum wage jobs are part-time where you may only work 4 to 6 hours too. A cheaper alternative is a bus that can cost $3 or so roundtrip, but that is if it even gets you to your destination as many routes have been cut back. Time to dust off the tricycle. A young stockperson I was chatting with remarked about how many coupons I have. I told him I use my coupons with the item being on sale at 50% off or more. He said he didn’t realize that you can use a coupon with a sale item. Ahhh, youngsters… I then told him if you loudly clap three times at the register you will get triple off on the coupon automatically. Ikea has a deal for college students. Click on the link below to get a FREE Entree (up to a $6.99 value). You will need to present your Student ID to get the freebie. The offer is good through July 2, 2011. Not valid at Ikea Houston or Ikea Home Shopping. Reserve a RedBox movie on-line between now and July 27th and you will get an automatic $0.50 discount on Wednesdays when you reserve your movies on-line. If you haven’t signed up for Swag Bucks yet, now is a great time. Earn points that can be cashed in for merchandise. New members get 30 FREE Swag Buck when they sign up. Plus use code JUNEBOOM to get an additional FREE 50 Swag Bucks! Code expires on June 30, 2011. Play the Biggest Saver contest. If you saved at least $100 you have a good chance of winning. Send in your receipts showing your coupon savings from the Sunday PD coupons and you can win a $25 gift card from Dave’s Market, Giant Eagle, Heinen’s, and Marc’s. Up to 5 entries. Twelve weekly winners will receive $100 in grocery gift cards. Contest runs through September 3, 2011. Save and win! The entry form is in Sunday’s PD or go to http://www.plaindealer.com/biggestsaver. If you find a lower published rate for the same hotel and accomodations for the same dates at any other qualified online source, simply complete the Best Internet Rate Guarantee claim form within 24 hours of your booking and they’ll give you the best rate…plus an additional 10% off! Look for BOGO 2 piece Kentucky Grilled Recipe $5 everyday meal coupon in Sunday magazine. Dredgers Union Store – East 4th in Cleveland – mostly clothing made in Cleveland/USA and home good. China Wok – loacted at 6178 Dunham Rd in Maple Heights – find coupons for it in the Neighborhood News. Old Navy is thanking their Facebook Fans with a printable coupon to stock up on $2 solid tanks for women, girls, and toddler girls. Go to their Facebook page for the deal. Find Old Navy clothing over 80% off on their web-site. This week at The Knot Wedding Shop, shop best-selling reception items at up to 80% OFF! Personalized Beverage Napkins, are now available at their lowest price EVER — only $13.99/100. When people write their phone numbers down they will remember they were at your wedding! Wednesday Only: FREE Shipping on $99+! Through Monday, June 27th: 15% off $100+ with code SECRET15. $30 for Anti-Aging Facial Treatment from Lynette Crawford Skin Care ($65 Value)! $15 for $30 worth of Tom Ford, Armani, Marc Jacobs and more designer shades at Gaffos.com – plus free shipping! $14 for 18 Holes of Mini Golf for Four People (Up to $28 Value) at Mulligans in North Ridgeville. Spend $11 for a day of elegance at Debonné Vineyards (regularly $26), where you’ll enjoy a private tour and tasting at Ohio’s largest estate winery — boasting over 130 acres of vines. Enjoy a sampling of four internationally award-winning wines, including the vineyard’s famous ice wine, while munching on cheese and crackers. Afterward, head to the Grill at Debonné, and use a $5 food voucher to bask in a classy afternoon of jazz on the lawn during the Jazz on the Vine concert series. For $25 will get $50 to experience one of the most coveted dining experiences near the shore at Nemo Grille in Avon. For $65, you get a zip-line tour, photography package, and nine holes of disc golf at Hocking Peaks Adventure Park in Logan (a $130 total value). Click Akron for City to find deal. For $5, you get $10 worth of fresh-baked cookies at Carriage House Bakery & More in Avon. For $35, you get a manicure and pedicure at Changes Salon in Chagrin Falls (a $70 value). For $20, you get $40 worth of clothing at Avalon Exchange in Cleveland Heights. • For $31, you get a ticket for seating in section 104, 106 (rows 15–30), or 128 (rows 15–30) (a $49.50 value before fees, or up to a $62.95 value online, including all ticketing fees). • For $57, you get a ticket for seating in section 7, 101, 103, 106 (rows 1–14), C108, C109, C125, C126, 128 (rows 1–14), 131, or 133 (a $99.50 value before fees, or up to a $114.45 value online, including all ticketing fees). • For $83, you get a ticket for seating in section 4–6, 108, 110, 111, 123, 124, 126, C110, or C124 (a $149.50 value before fees, or up to a $165.95 value online, including all ticketing fees). For $20, you get $40 worth of bistro fare at Quince, located in Olmsted Falls. For $22, you get $45 worth of any kids’ classes at Learning Advantage Education Center and Preschool in Lyndhurst. 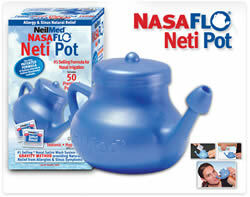 Get your Netipot for free! Use it for tea, for your china cabinet, or to clean out your nose as intended. The Thursday, 6/23 Cleveland Plain Dealer has a $5 off a $20 purchase coupon in the front page section. Other papers may have the coupon too. Spend $50 for $200 toward any mattress set at Mattress Warehouse. Includes nine Cleveland area and ten Akron area locations. You’ll have better dreams knowing you got a deal on your bed. And if you’re gonna spend money on something, spend it on something you use every day that is unless you sleep on a hammock in the backyard. Free day for people over age 55 on Friday, June 24th at the Cleveland Metroparks Zoo. The Senior Safari will include free health screenings. Save time and money. Experience as many Northeast Ohio attractions as your time and personal interests allow. Plus Passholders save at least 30% off of general admission ticket prices. Get your Cleveland Plus Pass TODAY! AAA (must purchase at AAA office). Tickets are for $1 off regular summer admission prices. Phone 216-606-6225 or 800-711-5370. Cleveland Metroparks online store. Delivered in 2 weeks or less. Shipping charged. Discount Drug Mart. Tickets are for $1 off regular summer admission prices. Available at select locations. Visit your local Discount Drug Mart store for details. Many companies offer Good Any Day tickets through their Human Resources department for $1 off regular admission prices. They must be purchased through your HR Dept. Call 216-635-3389 for more information. On Mondays, the Zoo (not including The RainForest) is FREE for residents of Cuyahoga County and Hinckley Township. * From Memorial Day through Labor Day, if Monday is an observed holiday, free Zoo admission applies on Tuesday instead. If you qualify for free Zoo-only admission on Mondays, tickets for The RainForest may be purchased at the following rates: Adults (12 and older) are $5.00, Children (2-11) are $3.00, and Children under 2 are free. *To confirm your residency, bring your driver’s license or state I.D. or a current utility bill with your Cuyahoga Cty. or Hinckley Twp. address along with a photo ID. Members of reciprocal zoos receive free or discounted admission to the Zoo and The RainForest (reciprocation covers the two named adults and two kids for a reciprocal family membership). Get 80% off already discounted restaurant gift certificates! Get $25 gift certificates for $2 (normally $10)! They also have some $50 gift certificates for $4 after the code! Use promo code “SUMMER” at checkout. You are currently browsing the JoeTheCouponGuy.com Deals Blog blog archives for June, 2011.